Desire or Keenness to Succeed. The traits a dog is born with will be the traits he will die with. An example of breeding regarding dogs might be - could you make a sheep dog out of a bull-terrier, a greyhound, a Pekinese or perhaps a Chinese chow? Maybe a greyhound may do something for you or even the bull-terrier but imagine the effort needed. You would need total control and your mind would need to work like a computer (but much faster than most) and the control perfect to match the movements of fractious sheep and anyhow why bother because these dogs have been bred as they are, for different jobs or for man’s pleasure. We will get there faster if we, first of all, make sure that we have the right pup to ‘break in’ for sheep work. It takes many different and varied traits to be bred into a dog to make a good sheep or stock dog; these we should look at. So if we set out the ingredient needed for a dog to control stock and for us to control him, perhaps it might be. Good Type: Why is this important? Surely beauty is in the eye of the beholder? This may be so but certain aspects of type are relevant to cater for a working dog’s need for speed, agility, mobility and stamina. Legs and pads that will stand up to the miles he has to do, he needs sharp hearing and a coat that can stand our hot and cold conditions. So let’s take speed, agility and mobility first. A kelpie needs to be long enough in the leg to cover the miles he will be expected to cover - a working dog travels at the rate of 10 to 1. If you travel a mob of sheep say 3 km then a dog working them will have travelled 30 km. Many a grazier travels stock 6 or more km in a day. He needs to be a little loose of coat and limb for agility, not too tightly muscled or square of build (a. Belgium-blue with double muscling and post in each corner can’t run fast for long). A kelpie needs to be somewhat narrow of stance with a deep chest for greater lung and good heart. 60 to 45 degrees slope of shoulder for good free stretch of the front legs (A greyhound, foxy-whippet or whippet rather than a. British-bulldog or bull-terrier). A kelpie’s ears should be erect or semi erect for sharp hearing and his coat should be short and sleek to stand our summer extremes. He should have an under down for the cold. A kelpie’s pads should be compact, deep and firm. He should stand on them square with his toe nails pointing vertically down and touching the ground. Good deep pads will cushion the impact of his running. They should be preferably dark in colour for hardness, with no hair between the toes to catch grass seeds. Border Collies (especially the old long hair types) have a real problem with grass seeds ‘working in’ between the toes and often break down in late spring - summer because of this when you need them most. Does this come under the umbrella of good type? I suppose so. Many years ago, when I. was a lot younger and maybe not as wise, I visited a NSW noted kelpie breeder. I called in unannounced, dressed typically for a Victorian Western District grazier, polished tan boots and moleskin pants etc. - you know. The late Mike looked me up and down and said ‘A f... Victorian and I suppose you have come here to buy a f... red & tan!’ He was right of course, but he could have left out the adjectives at least on the first bit anyway. He went on to say ‘Don’t you silly buggers know kelpies come in seven different colours and it’s hard enough to get a good one without narrowing your chances down by worrying about what bloody colour it is.’ Mike apologized later and explained that his wife had left him the night before and he wasn’t in a very good mood. Gunga, black and tan - Flint Judy and Johnny are red and tans. In some animals they have proved that colour genes are inextricably linked with other genes. In some animal breeds certain colours always have certain temperaments, other breeds might have colour linked to coat quality or ear shape or any of a host of seemingly unrelated things. Scientifically, this is due to that particular breed, strain or line having the colour genes on the same ‘arm’ of a chromosome as the genes for the associated trait, so that when sexual reproduction occurs and. chromosomes are halved the genes on any given ‘arm’ stay together and are passed on. Offspring who received that ‘arm’ will always have both traits. Maybe this accounts for the fact that in past years all black kelpies were called. ‘Barbs’ and were known to be an exceptionally tough and forceful breed. Maybe today most kelpies that I come across that have a classic paddock cast - with natural break off are cream or yellow in colour and perhaps it might be the reason why most blue kelpies are subject to skin problems. The old blues used to scratch and itch so much they were known as the hairless breed, but will we ever know for sure, what genes are linked to colour in certain strains? Probably not, I would think. Over the years I have found colour has got some relevance, e.g. Light dogs with pink or light points can get sun burnt but light dogs with black points don’t and they stand the heat quite well. But more importantly is the reaction of stock to colour. Have sheep got colour vision? They tell us not. Or do they just see black and white and shades of grey? I have not looked into this subject fully. No doubt others have, but I do know that sheep, goats, cows and possibly most domesticated stock show little or no fear of other animals that are white or cream in colour. They do however react and show fear towards dark coloured animals. Proving this to some degree is the fact that sheep and goats will accept the white or cream Maremmas as guard dogs. The sheep will let these dogs live in their midst and show no fear of them at all. It is also noticeable in a Three Sheep Trial; if a white dog is competing the sheep seem far more relaxed, but often these light coloured dogs get into trouble on the bridge or pressure points because the sheep often refuse to move for them. 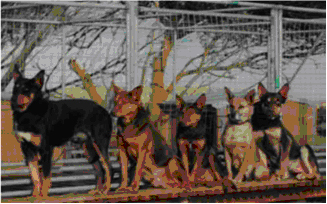 Black and dark tan dogs or straight blacks often have the other effect. Sheep tend to move off quickly from them, but the inner strength in a dog still has the biggest influence as to whether sheep move off a dog or not. The late Frank Scanlon was noted for his dark blue kelpies. Creams, fawns and blue kelpies were far more common in yesteryear than they are today. These coloured kelpies would have been ideally suited to sheep, in bush runs, that were possibly only mustered once or twice a year. Sheep not handled often would not spook so readily from a lighter coloured dog. I am sure in today’s more intent farming that the darker coloured kelpies are more practical.